Honours to be presented to worthy organisations operating across all facets of the anaerobic digestion sector. Fraddon, Cornwall plant will convert organic agricultural and local food waste into gas and electricity. Agreement calls for MT-Energie UK to construct and integrate additional digesters for two facilities on the Apsley Estate, Andover, Hampshire and at Clayton Hall Farm, near Wakefield, West Yorkshire. In both cases MT-Energie has been chosen to assess and carry out all works relating to the plant expansion, in some cases replacing components supplied by the previous technology supplier. 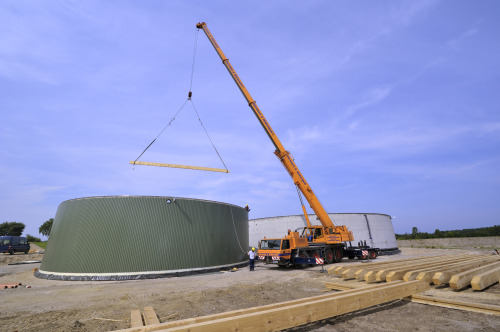 The 500kW AD plant on the Apsley Estate, which started operations in 2012, will be scaled up to generate a total output of 1100kWe and 2000 m3/h raw biogas, while the 400kW AD plant in Yorkshire will soon reach production of 1000kWe, expanding the actual stream of renewable energy produced on the farm. The two revised AD projects follow quite different strategies for the expansion programme. Thanks to the vicinity to gas infrastructure, at Apsley Farm it is proposed to integrate electricity production with gas-to-grid generation, thereby accessing the Renewable Heat Incentive (RHI) biomethane tariff. The feedstock will remain mainly of agricultural origin: grains, maize silage, energy beet and whole crop rye silage grown on the farms own land. On the other hand Clayton Hall Farm will increase the use of food waste as feedstock – they hope to reach 80% of the total substrate in this form, vs 20% from agricultural residues and purpose grown crops.